2018 marks 35 years since G-SHOCK first revolutionized timekeeping with its innovative toughness back in 1983. To mark the occasion, CASIO is releasing the DW-5900, bringing the look of a historical favorite back to life under a back to-original-basics theme. The design and face colors of the original models have been reproduced for this new version. 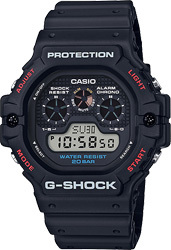 Basic features include stopwatch and timer, along with an EL backlight and more. Three graphic digital dials are similar to those that originated with the long-selling DW-6900 Series of 35 years ago revive a distinctive look for 2018.